An expertly crafted service area and kitchen make for a memorable evening at home every day. Standout experiences are just as much about the atmosphere and meticulously designed spaces as they are about cabinets and appliances. From sleek, ultramodern quartz, like a white quartz countertop to smart and contemporary designs, Granite Countertop Warehouse (GCW) designers are able to help you obtain a chic, elegant kitchen from some of the finest quartz available. Our designers have the tools, materials and knowledge necessary to help you obtain the look that matches your vision. GCW carries a vast selection of quartz colors needed to achieve your dreams. Caesarstone Quartz was used in the kitchen below to achieve a calm environment that gives the homeowner a sanctuary of respite and escape. 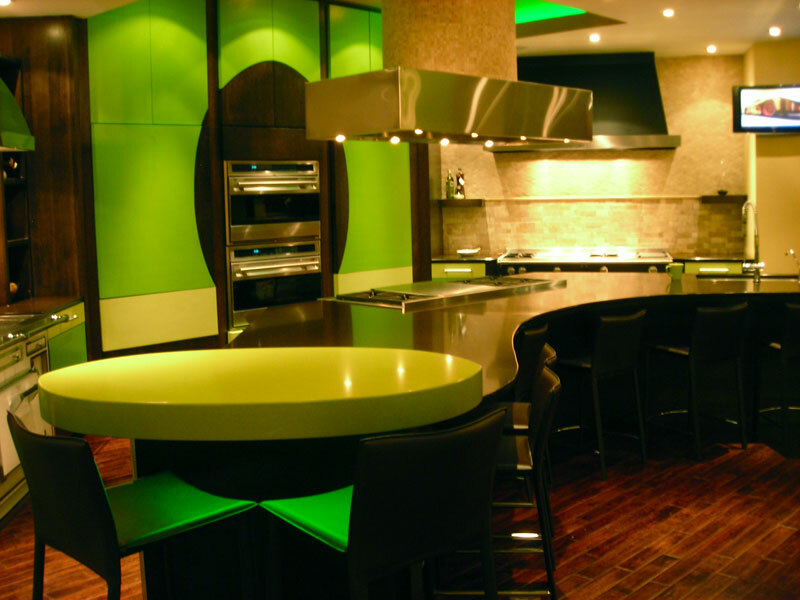 This quartz kitchen in the kitchen below uses the color called apple martini. This color complemented the high end appliances and woodwork perfectly. This look and its variations, is easily achieved with our expert designers. To set up a time to discuss your ideas, call 678-383-4583 or visit our stone design center.